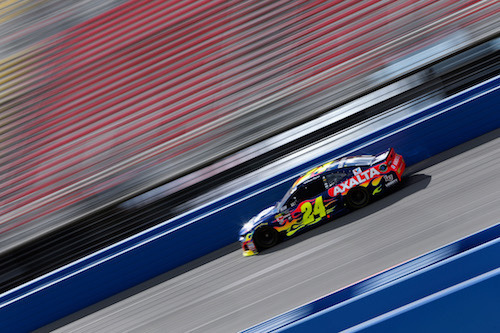 Eleven Monster Energy NASCAR Cup Series teams have been docked practice time at Auto Club Speedway on Saturday as a result of issues in pre-qualifying inspection Friday for Sunday’s Auto Club 400. The No. 51 Rick Ware Racing team of Timmy Hill was docked 15 minutes in the first of two practice sessions on Saturday as a result of being late to pre-qualifying inspection. The other 10 teams — the No. 9 Hendrick Motorsports team of Chase Elliott, the No. 10 Stewart-Haas Racing team of Aric Almirola, the No. 11 Joe Gibbs Racing team of Denny Hamlin, the No. 14 Stewart-Haas Racing team of Clint Bowyer, the No. 24 Hendrick Motorsports team of William Byron, the No. 47 JTG-Daugherty Racing team of A.J. Allmendinger, the No. 48 Hendrick Motorsports team of Jimmie Johnson, the No. 72 TriStar Motorsports team of Cole Whitt, the No. 88 Hendrick Motorsports team of Alex Bowman and the No. 34 Front Row Motorsports team of Michael McDowell, were each docked 15 minutes in final practice. McDowell’s penalty was the result of an inspection violation, while the other nine teams were penalized for twice failing pre-qualifying inspection.